Earn $4.99 in Rewards credit. Click to learn more. Specialized rubber for your Mavic wheels. The Exalith 2 Brake Pads are specifically engineered to withstand the extra-tough, all-black braking surface on Mavic's newest top-tier wheels. The unique compound works with Exalith or Exalith 2 brake tracks. Its designed to excel in wet or dry conditions and delivers superior durability compared to standard pads. For use on Exalith brake tracks only. 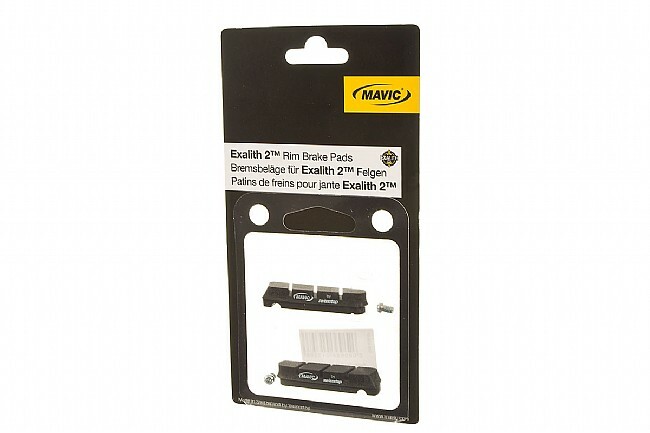 The Exalith 2 Brake Pads are available Shimano/SRAM or Campagnolo* compatible versions. 2 pads per set (one wheel). *Compatible with 10/11 speed Campy holders, including post-2011 versions. Expensive but does what they are suppose to, stops me fast!